the rising and falling of the water level at the shore of a body of water, such as a sea, lake, or reservoir, as a result of currents formed by wind action. Friction causes the air moving over a surface of water to entrain particles of water, and the motion of the particles at the surface is transferred downward. As a result, a layer of water several tens of meters thick is set in motion. The water level rises at the shore to which the water flow moves and falls at the opposite shore. The greatest fluctuations of water level occur at shore sections with a gently sloping bottom, in long bays that gradually narrow at the head, in narrow straits, and in river mouths; examples are the English Channel, the Gulf of Taganrog, the Gulf of Finland, and Ob’ Bay. At such places, the variations of level caused by surge reach 2–3 or even 5 m. Accompanying phenomena include exposure of the bottom and shoaling of navigable channels during drops in the water level and the inundation of islands and shores and the destruction of ports and other structures during rises in the water level. Heavy flooding caused by the setup of seawater occurs on the coasts of the Netherlands, Belgium, and Great Britain and at the mouths of the Neva, Thames, and other rivers. the oscillatory movements of water in ports, bays, and harbors, causing cyclical shifts of moored vessels. Such movements are caused by long waves, with periods of 0.5–5 min and usually up to 30 cm high, which form as a result of the action of wind and swells that are developed by strong winds over the sea in adjacent areas. The intensity of surge depends on the natural period of oscillation of the water in the harbor and on the nature of the change in depth on the harbor approaches. Surge causes difficulties in loading operations in the port, and it may cause damage to ships if mooring lines part. The intensity can vary among the docks within a port. Surge is observed in many of the world’s ports, including Dakar, Casablanca, Le Havre, Bombay, and especially the ports of Japan and New Zealand. In the USSR it is observed in Tuapse, Batumi, Sochi, Klaipeda, and Korsakov. The main method for the prevention of damage from surge is the use of special mooring procedures. Timely prediction of surge is also important. An unusually violent solar prominence that usually accompanies a smaller flare, consisting of a brilliant jet of gas which shoots out into the solar corona with a speed on the order of 180 miles (300 kilometers) per second and reaches a height on the order of 60,000 miles (100,000 kilometers). A momentary large increase in the current or voltage in an electric circuit. An upheaval of fluid in a processing system, frequently causing a carryover (puking) of liquid through the vapor lines. An unstable pressure buildup in a plastic extruder leading to variable throughput and waviness of the hollow plastic tube. A wave at the free surface of a liquid generated by the motion of a vertical wall, having a change in the height of the surface across the wavefront and violent eddy motion at the wavefront. Wave motion of low height and short period, from about ½ to 60 minutes. A sudden voltage rise and/or fall in an electrical current. 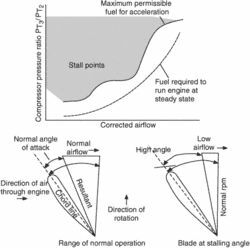 An unstable condition in which the airflow breaks down over the compressor or turbine because the blades are at very high angles of attack. This condition can occur either because the aircraft is flying at a high angle of attack or very low speeds or the throttle was opened very rapidly. It may also occur because the fuel system malfunctions. A surge is characterized by local bangs, fluctuations or a fall in the engine RPM, and a sudden increase in the turbine temperature. It is more prevalent in axial-flow rather than in centrifugalflow compressors. Sorter, Updater, Report Generator, Etc. IBM 704, 1959. Sammet 1969, p.8.